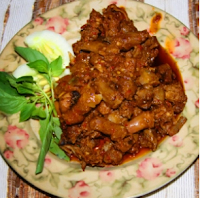 Typical recipes Nasu Ducks Palekko Bugis Sedap .Each area in the archipelago certainly have a recipe with its own traditional flavors . For South Sulawesi precisely Pinrang then nasu palekko district is one of the most popular. The cuisine is popular because of the biting sensation of spiciness . Not to mention the taste sensation that taste savory ducks and different from chicken meat . That's why this cuisine would definitely be a very fitting choice for lovers of spicy cuisine. The cuisine is also one of the favorites menu when Eid arrives . Moreover, this cuisine using ingredients that are easily obtainable and also the manufacturing process is very practical . To the basic ingredients that duck of course we can not be careless in choosing her ducklings . Should we choose young ducks because of old duck meat tends textured hard . This young ducks need to be washed with water and then mixed with tamarind water . Water use of tamarind is very important that the fishy smell of duck no longer smell . After a fishy smell in ducks is missing then we just stayed separating the skin with duck meat . Leather ducks need to be split because the skin is then to be used as oil for frying . Surely oil produced from the skin of the duck would be more savory and delicious to make a dish . Can not wait to taste the flavor spicy duck palekko nasu this with your family? Try to make it based on the range of materials and the manufacturing steps below. Take the young ducks which had been cut later coat with lime juice and 1 teaspoon salt. Allow the duck for about 10 minutes to allow the flavors to infuse. After 10 minutes passed, wash the duck meat under running water then drain. Baluri duck with tamarind 100 ml of water, 1/4 teaspoon powdered chicken broth and remaining salt. Knead the duck meat and then let stand for about 10 minutes. Prepare a frying pan and pour the cooking oil. Enter ducks and marinade. Mix well and continue to cook until the duck meat changes color. Pour water and then cook until the duck meat was really tender. Pour the remaining water tamarind, onion, green chili, turmeric powder, powder and remaining chicken stock and stir until evenly distributed. Cook until the water continues to shrink. When the duck meat cooked through and sauce shrink, turn off the heat. Lift dishes from the wok. Nasu cuisine palekko ducks will be very fitting if served while still warm. 0 Komentar Untuk "Typical recipes Nasu Ducks Palekko Bugis Sedap"